Wood Choir Chairs and Church Chairs by Dumas Manufacturing are available in variety of styles, wood types, finishes and upholstery colors. These chairs are made from the very best oak or sycamore woods and can be finished to any color of stain. These choir chairs are stackable. Dimensions are 32"H X 20"W X 18"D without kneeler, Dimensions are 32"H X 20"W X 22"D with kneeler. Choir chairs are sold individually or as a set with other Chancel Furniture. Please call us if you have any questions. Dumas manufactures and sells the finest church chairs and choir chairs, known for their comfort, beauty, strength and value. 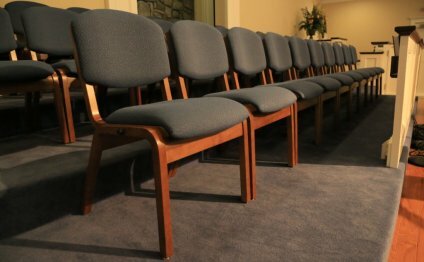 Chairs are becoming one of the most popular means of seating in churches today. They offer many forms of versatility in our fast paced, multifunctional society. Dumas offers stackable church chairs that can fill any need. The furniture looks like it is part of a permanent worship setting. It is easily moved, allowing multi-purposes of the building. We proudly sell our products throughout the United States and the Bahamas, but primarily serve Alabama, Mississippi, Georgia, Tennessee, Louisiana, Texas, Florida, North Carolina, South Carolina, Kentucky, Indiana, Ohio, Arkansas, Missouri, Virginia, West Virginia, New York, New Jersey, Connecticut, Rhode Island, Pennsylvania, Delaware and Maryland. Pulpit Chairs, Church Chairs, Church Furniture and Courthouse Seating have been manufactured by Dumas Pews for over 80 years. Dumas pulpit chairs and court house chairs are made from the finest quality hardwoods by skilled craftsmen with years of pew and church furniture manufacturing experience. Tens of thousands of satisfied church chair customers can attest to the quality work of Dumas Manufacturing. Our church furniture products include church pews, church pulpits, pulpit chairs, church chairs, choir chairs, communion tables, offering tables, speaker stands, tithe and offering boxes, complete church furniture sets, and church furnishings. Each and every piece is made right here in Alabama by master furniture craftsmen to assure the best quality available.